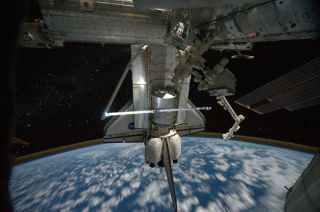 This view of the space shuttle Atlantis while still docked with the International Space Station was taken by a crew member aboard the station on the final day of joint activities between the crew members for the STS-135 and Expedition 28 missions. The robotic arm on the shuttle appears to be saluting "good-bye" to the station. Earth's airglow is seen as a thin blue line above Earth's horizon. The Raffaello multi-purpose logistics module, full of items to be returned to Earth, is seen in the aft cargo bay, July 19. 2011. Flight Day 12. HOUSTON — The space shuttle deployed its last satellite Wednesday morning (July 20), just one day before the shuttle Atlantis is set to land for the final time, with astronauts reciting a poem for the occasion. The release of a tiny satellite called PicoSat for the U.S. Department of Defense was the last in a long, long list of accomplishments for NASA's 30-year-old space shuttles. After Atlantis lands on Thursday (July 21), those ships will be retired for good. After PicoSat's release into orbit, Atlantis mission specialist Rex Walheim read a special poem about the shuttle's history of payload deployment. Then celebrate the shuttle with our friends on the ground," Walheim said. "Outstanding, Rex, we applaud you," spacecraft communicator Barry Wilmore said amid cheers from Mission Control. The four-astronaut crew flying Atlantis' STS-135 mission released the PicoSat into orbit via a spring ejection canister at 3:54 a.m. EDT (0754). The mini spacecraft is covered with solar panels to test new solar cell technology. "Atlantis, Houston, Congratulations on the 180th successful deployment of a payload from the shuttle's payload bay," Wilmore said. "We copy that, Houston," Atlantis' commander Chris Ferguson replied. "We'll call the deployment time MET [Mission Elapsed Time] 11 days 16:20." A close-up look at the small PicoSat satellite deployed from NASA's space shuttle Atlantis on July 20, 2011 during the final space shuttle mission. The small satellite was the 180th and last payload deployed from a shuttle. PicoSat, officially named the Pico-Satellite Solar Cell test bed, is a small rectangular box about 5 inches by 5 inches by 10 inches, and weighs only 8 pounds (3.7 kg). It has its own solid rocket booster propulsion systems, communications capabilities, a GPS unit and solar cells for gathering energy. PicoSat is expected to operate on orbit for three to nine months. During that time it will also perform two experiments for the DoD. One, called the Miniature Tracking Vehicle experiment, will test whether a nanosatellite like the PicoSat can serve as an orbiting reference point for ground tracking systems. The second, called Compact Total Electron Content Sensor, will monitor space weather and detect the density of the Earth's ionosphere. Atlantis is slated to land at NASA's Kennedy Space Center in Florida on Thursday at 5:57 a.m. EDT (0957 GMT). The shuttle departed the International Space Station on Tuesday (July 19), where it dropped off a shipment of spare parts and new supplies for the orbiting outpost. NASA is retiring its space shuttle fleet after 30 years of flight to make way for a new program aimed at deep space exploration. After this flight, Atlantis and its sister ships Discovery and Endeavour will be sent to museums for public display. You can follow SPACE.com Senior Writer Clara Moskowitz on Twitter @ClaraMoskowitz. Visit SPACE.com for complete coverage of Atlantis' final mission STS-135 or follow us @Spacedotcom and on Facebook.